Despite the relative peace and tranquility in dollar-denominated credit markets at present, the “dollar” itself continues to rise. Clearly the acceleration of that trend has waned in recent weeks, but nonetheless is still moving upward to the point it is at the highest level in more than a decade. Somehow most commentary takes such a massive and sustained move in stride, as if it were a reflection of purported economic strength in the US or at least the end of ZIRP’s “favorable” impression on interest rate differentials (and even a combination of those two). If that were the case, then it would be the first time under the wholesale money system’s dominance that the “dollar” acted in such a fashion. 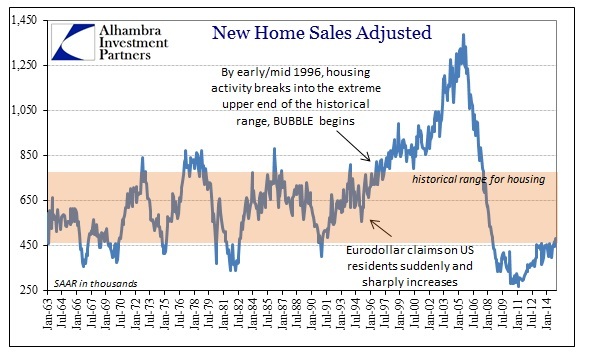 The last time the US economy was acting even slightly “robustly” was during the last, great housing bubble in the middle of the 2000’s. Beginning in June 2004, the FOMC began to increase interest rates as Alan Greenspan judged his efforts as fully completed. Yet, despite rising nominal rates across the shorter end of the yield curve, the “dollar” did not rise and instead moved opposite. The course of tiny, incremental rate hikes lasted until July 2006, taking the federal funds target from a historic low of 1% all the way up to 5.25%. 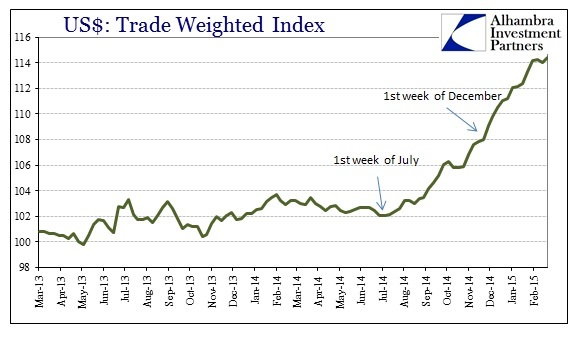 Almost a year before then, the trade-weighted dollar had already begun its precipitous decline as the behavior of the “dollar” did not at all match better (though artificial) domestic growth nor rising interest rates conferring “better” differential enticements. Further, as seen via TIC flows, there was a massive and sustained “inflow” into foreign holdings of UST (along with other dollar-denominated securities) which “should” also have led to a rising dollar price – increased demand for dollar assets, especially in better growth and higher interest rates is supposed to lead to a rising dollar. As you can see plainly above, the “dollar” did the reverse. While that focus on demand is itself misleading due to how the world accounts for the “dollar” (rather than the actual dollar that no longer exists), the behavior of the “dollar” price fits better with supply rather than demand. Alan Greenspan and Ben Bernanke were mystified by all this, coming up with the ludicrous idea of a “global savings glut” to provide at least some academic framework to the polarizing “dollar” behavior. 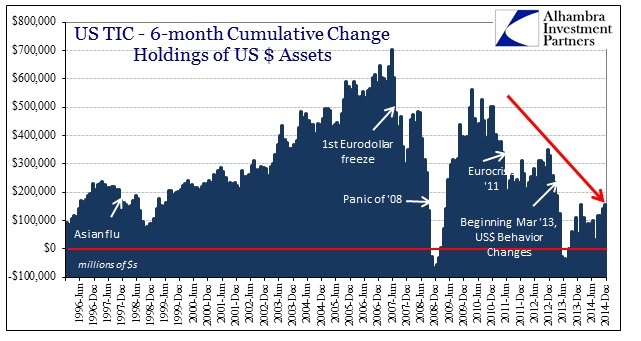 In other words, those TIC “inflows” were not, instead were related to the growing and massive supply of “dollars” mostly on foreign offer – eurodollars that remain still largely unobserved. That puts the “price” of the “dollar” not as some fundamental view of the US economy relative to others, or even domestic interest rates in comparison with others, but rather as a barometer of the global “dollar” short. 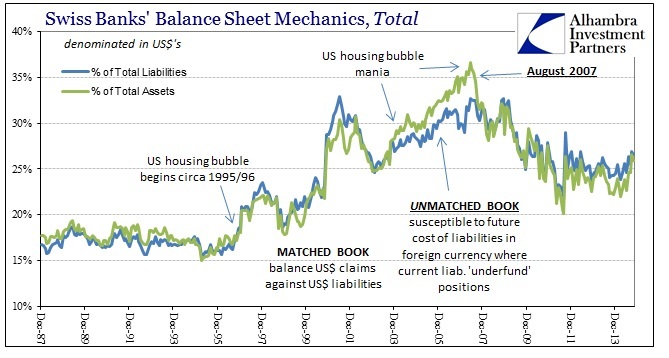 The expansion of bank liabilities denominated in “dollars” and traded on the eurodollar market are thus the actual expression of economic behavior, as close as one might come to describing anything as such. 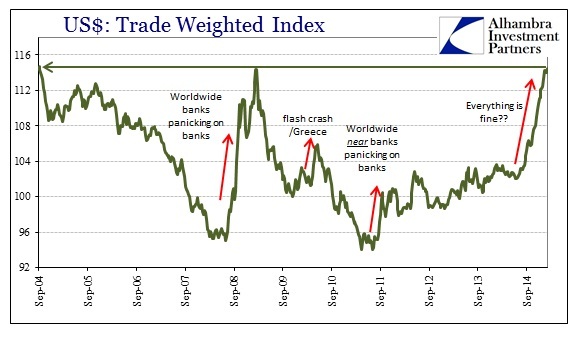 When expected volatility is low, bank balance sheets clearly expand, offering plentiful new “dollars” into the global market (which was supposed to be for trade but began to be bastardized as early as 1985 to turn eurodollars from the replacement for the gold standard into a massive financialization conduit). 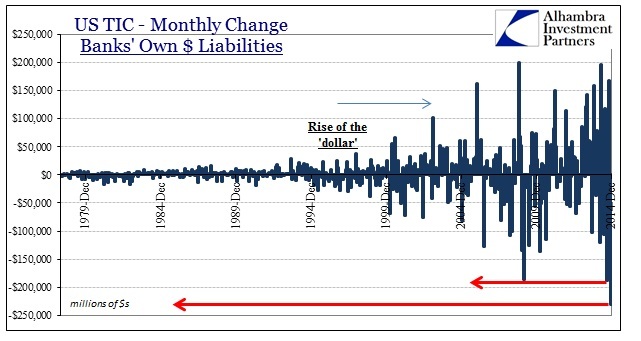 All of which brings us back to the “rising dollar” that began at the end of June 2014. Again, economists are trying to justify it as better growth in the US, but clearly that would be the first time the wholesale “dollar” acted in such a fashion.  Instead, the increase points to growing and sustained contraction in “dollars” on offer, which would lead to the opposite conclusion – that global finance is growing more and more pessimistic about volatility, including any coming from the lack of actual growth in the real global economy. 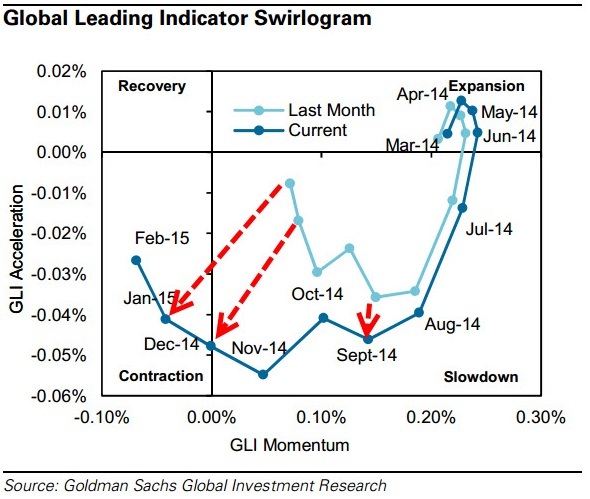 This morning, via ZeroHedge, Goldman Sachs updated its “Global Leading Indicator Swirlogram” which switched from “expansion” to serious “slowdown” right from June to July. That would put the “rising dollar” directly in corroboration of that expanding economic dislocation. In addition, not only has the slowdown been revised significantly lower it has reached unambiguously the contraction phase – right around December when the second of the illiquidity episodes reached its crescendo (the first ending on October 15). While this “swirlogram” is a composite of various global growth indicators, I don’t think it as a top-tier data point either. However, it is at least one piece of evidence that does link up the seriously “rising dollar” with the seriously declining global economy. And while Janet Yellen will ignore that as globally irrelevant to the US, the transmission of global trade and the US’ place within it is demonstrative as inseparable. Just ask crude oil traders. Historically speaking, the “rising dollar” indicates nothing good about the US economy, the global economy or the global financial system (which are all intimately linked). The “dollar” system is clearly evolving, beginning back on August 9, 2007, but there is nothing to indicate that a permanent or even temporary replacement has been found, installed and begun operation. In fact, central banks are working feverishly not to hasten that transformation, but in reactionary fashion to go back to the 2004-version. In short, there is every indication now that the “rising dollar” is as it has been this century. That’s the bad news.